The new Alcatel Verso is one of the cheapest Android smartphones that you can now purchase in the United States. US carrier Cricket Wireless now offers the Verso for free with number transfer or $30 with new number (or current customer upgrade). As you might have guessed, the Alcatel Verso is far from being impressive specs-wise. It's true, the Verso runs Android 7.0 Nougat, which is quite decent even for a 2018 smartphone. However, the handset sports a modest 5-inch display with FWVGA (854 x 480 pixels) resolution and Dragontrail Glass. It's got a 1.1GHz quad-core processor, 16GB expandable storage (up to 128GB) and possibly 1GB RAM. On the back, the Alcatel Verso features a 5-megapixel camera with LED flash, while in the front there's a secondary 2-megapixel selfie camera. Surprisingly, the phone comes with LTE support and a more than decent 2,050 mAh battery. 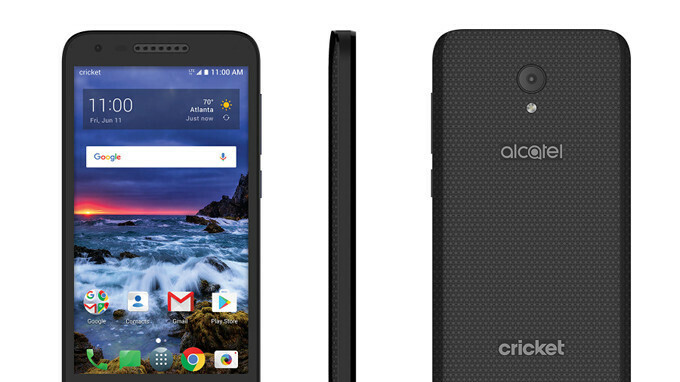 That's about all you get out of the Alcatel Verso, so if you're looking for a second smartphone or need a very cheap Android device, Cricket Wireless may have the best solution. Wow, $30 bucks for this smartphone. I remember back in 2010 getting a Samsung Nexus S with a single core 1 GHz arm CPU with 512 MB of RAM and 16 GB of non expandable storage with a 800x480 4" display for $500. This smartphone has a 5" 854x480 display with a 1.1 GHz quad core arm SoC, with 1 GB of RAM and 16 GB of expandable storage. Just checked. It actually has a 2GB ram. Pretty good for its price. Well, I didn't wait long enough for this phone to come out. Already bought the holster and screen protectors for my next phone, only a day before this one surfaced on Cricket. And the phone that I am going to order went up in price by ten bucks... oh well!